Negotiators at the Paris climate talks can’t forget the outsized role international shipping and aviation play in emissions of harmful greenhouse gasses. International shipping and aviation play a big role in emissions of harmful greenhouse gasses, but they are often overlooked in emissions conversations. When don’t greenhouse gas emissions count? When they’re emitted during international transport, of course! Amazingly, this is the current status quo. This week, the United States and more than 190 other countries are meeting in Paris to negotiate a climate treaty, which will be built largely on the pledges of individual nations to cut down on greenhouse gas emissions. However, because of accounting procedures approved by diplomats during past climate talks, countries are responsible only for the emissions that occur within their borders. Unless they are specifically addressed in the new agreement, emissions from international shipping and aviation will fall through the cracks. And the impact of these emissions is enormous. The combined emissions from these sectors already have a climate impact similar to that of Germany or South Korea. Even more worrisome is the fact that by 2050, their emissions are expected to quadruple and double, respectively. The now-defunct Kyoto protocol addressed this loophole by requiring the international community to reduce emissions from shipping and aviation through the international organizations governing these industries: The International Civil Aviation Organization (ICAO) and the International Maritime Organization (IMO). But the drafters of the treaty that will be taken up at the Paris negotiations have threatened to drop language obligating the aviation and shipping sectors to do their part. 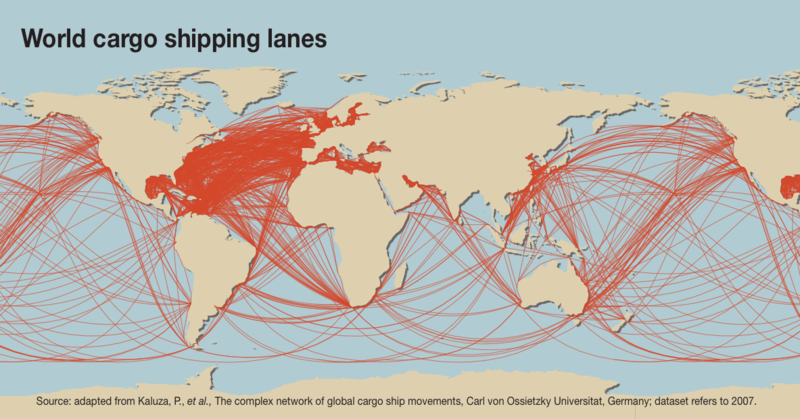 Global shipping lanes that transport around 90 percent of the world's trade. Emission reduction targets for international aviation and shipping need to be agreed on so that these sectors can begin to contribute to the global goal of avoiding a temperature increase of more than two degrees Celsius. Countries participating in the Paris talks should include domestic shipping and aviation in their emissions reduction pledges. They should also agree on a mandate for ICAO and IMO, requiring them to set realistic reduction targets and adopt measures to implement them. ICAO has almost finished work on a CO2 standard for new aircraft, and while it’s currently not strong enough, the mechanism could be used as a starting point for deeper and more widespread reductions. Work on a global, market-based measure for aviation, intended to begin in 2020, would be strengthened by a clearly defined role in the global climate agreement. The IMO has put in place a design-efficiency standard for new ships that took effect in 2013, but it will take a generation before the standard achieves any meaningful reduction in emissions from the global fleet, and its stringency and effectiveness are in question. Like ICAO’s CO2 standard, these efficiency requirements should be ratcheted up to achieve greater fuel savings. Discussions at IMO on tracking and capping ship fuel consumption have stalled, but could be reinvigorated by a strong request from the Paris agreement. If we are to achieve the goal of holding global temperature increases to below two degrees Celsius, the aviation and shipping industries, two large and growing sources of carbon pollution, must do their part to reduce emissions. Without their contribution, other parts of the economy will have to shoulder greater burdens. It’s imperative that the obligation to reduce carbon pollution from these sectors stays firmly embedded in the final Paris agreement. Why leave any achievable emissions reductions on the table? The Road to Paris and Beyond is a blog series exploring how Earthjustice’s climate and energy work will help strengthen the goals to be set by the United States and others during the 2015 United Nations Climate Change Conference in Paris, and the development of the new global climate agreement. The Paris Climate Change Conference (aka “COP21”) begins on November 30 and runs until December 11, 2015.